The pricing model for some home entertainment equipment like DVD players has reached the point where the majority of the price you pay has gone toward the software licensing fees bundled into the cost of the item — MP3, MPEG, and other codecs, plus an embedded operating system. The last few home entertainment devices I've purchased have been from Philips. The Dutch do good work, I have found Philips players to be more agile than most about playing DivX and Xvid movie files and interacting with USB-connected storage. The Dutch do good design, the specification of what to build. But these aren't coming out of factories in Holland. They're built in China, and they connect home when they get the chance. When I bought my first Blu-ray player, a Philips BDP2105, I noticed that it included some rather bulky paperwork describing the software licenses. There was a software end user agreement, which, as usual, said that in the case of the Windows components I don't own anything even though I paid money. I just get to use it for a little while in a very restricted way. The paperwork went on to say that the system may include some open-source software, and if so, there were no restrictions beyond adhering to the open-source licensing. The setup menu can show you the Ethernet MAC address. Mine was 00:1C:50:AC:72:1E. I connected its Ethernet port to a 100 Mbps switch, and assigned it a specific IP address in /etc/dhcpd.conf on my server. # No service on these subnets! # a while, so reference /8 blocks. # Internal network, run a server. # needed for IPsec to define identity. I also set up DNS records so bluray resolves to 10.1.1.231 and vice-versa. And within six seconds it is trying to resolve www.ecd.interface.philips.com. That resolved to 162.13.31.14, which had been allocated to Rackspace in the UK. So yes, it is running Linux of a late 2.6 kernel. Where is this voole.com domain? China. Was not authorized to use! Please check uid,oemid,hid.They are must no empty. Finally, http://mcs.voole.com/ gets a login screen. The obvious URL http://www.voole.com suggests that voole.com is some sort of on-demand movie provider, something like Netflix. I turned the player off, started Wireshark to capture just those packets sent to/from the Blu-ray player's MAC address, and turned the player back on. Once I had captured the startup sequence, I did another Nmap scan but this time with the -p0-65535 parameter to scan all possible TCP ports. It was no longer listening on TCP port 8080 with an automatic redirect, now it was listening on TCP ports 33682 and 35182. 00b0  90:9f:b8:59:a0:86:57:ed  5e:9d:26:a4:05:76:d6:c3    ...Y..W. ^.&..v..
00c0  3e:d3:5c:1a:2f:07:04:f6  bc:be:24:91:90:4b:15:ee    >.\./... ..$..K..
00d0  85:20:f7:6c:b6:95:40:29  44:70:59:4c:3c:7c:11:f7    . .l..@) DpYL<|..
00e0  4e:ff:48:5a:55:40:30:74  4b:34:fb:73:52:f8:31:a0    N.HZU@0t K4.sR.1. 00f0  9c:47:6b:88:8e:b1:e5:95  d9:64:c4:49:7a:49:9e:b7    .Gk..... .d.IzI..
0010  44:15:18:d5:e5:74:38:75  5c:3d:1f:25:4e:0d:55:16    D....t8u \=.%N.U. 0013  34:b1:12:24:60:fb:c5:df  36:53:81:19:ac:3a:ce:de    4..$`... 6S...:..
0014  63:8d:26:1b:98:60:5e:8d  0a:8c:75:a9:3f:dc:d7:21    c.&..`^. ..u.?..! 0015  77:b3:b0:80:9d:8d:55:1f  df:9c:74:7c:ad:38:48:93    w.....U. ..t|.8H. I did another Nmap scan with the -sO -p0-255 parameters requesting a protocol scan, trying all 256 possible IP protocol types. ICMP as I would expect, and TCP which I already knew about, but also UDP and possibly IP protocols 136 and 152. Warning: 10.1.1.231 giving up on port because retransmission cap hit (10). It seems that out of the box it was running a web server at TCP port 8080 which redirected to the interfacepay.voole.com URL that returned the XML file containing several other URLs. But then once it had communicated with the server at www.ecdinterface.philips.com, it must have received an update telling it not to do that. I don't know if it was listening on TCP ports 33682 and 35182 at first, as I just did a default TCP SYN scan which only checks the 1,000 most commonly used ports. To see if an upgrade is available. After I had owned it for a few months, one evening it told me that software updates were available. Should it download and install it? 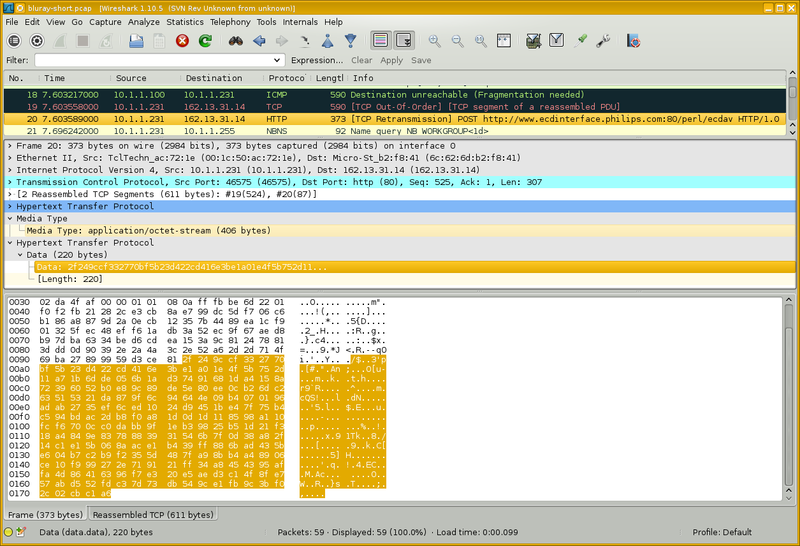 Once I got Wireshark to listening, I had it go ahead. It downloads a file with a name like /firmware/BDP2105/223/BDP2105.BIN from fds.cpp.philips.com. BDP2105 is the model, I would assume that 223 is a firmware version number. I used the wget command to download a copy of the firmware. This specific firmware file has 103,016,496 bytes. It starts with the characters PHILIPSBDP210500000. Once the firmware is downloaded, the on-screen dialog asks if you want to install the upgrade. You do that, and then you're cautioned to wait until the upgrade is finished. The system then restarts, which you see as the screen briefly going blank and then restarting with the introductory screen. The player listens on TCP ports 34465 and 52641 after the upgrade, versus 33682 and 35182 before. Connecting to either with a browser yields a very simple 404 error message.